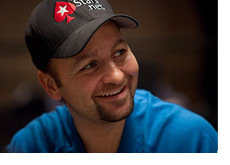 Can Daniel Negreanu Win His First EPT Title on Sunday? Thanks to a late day surge, Daniel Negreanu will enter the final table of the EPT Vienna main event with a sizable chip lead. With a victory on Sunday, Negreanu would become one of the few players to have ever won a World Series of Poker, World Poker Tour and European Poker Tour event. Negreanu would also surge past Phil Ivey to take the top spot on the all-time tournament money list with a win on Sunday. All eight of the remaining players in the event are guaranteed a minimum of 60k Euros for making it to the final table. The first place finisher will walk away with 700k Euros, which converts into nearly $1 million USD. Pocket Sevens treated Daniel Negreanu very well on Saturday, as he was able to win two very big pots with the hand. The flop was a good one for Erlandsen, as it came 9s-Jc-6s. The turn? The 7d, giving Negreanu a full house and the dominant lead in the hand. The river brought the 3c, and Erlandsen was eliminated in 10th place. Negreanu's other big hand with pocket Sevens saw him turn a full house on a board of 8d-2d-8c-7c-9s. Negreanu's opponent in the hand (Michael Eiler) called a sizable river bet from Negreanu, only to be shown Daniel's full house. The momentum seems to be on Negreanu's side right now, plus he has a wealth of final table experience that he will be able to draw on tomorrow. Can he pull it off and win his first EPT main event on Sunday?